Welcome back folks and thanks for coming. EpisodeÂ #4 is up and available for your listening pleasure. 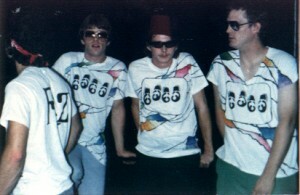 With the exception of the original live recording of Scared Fun and the practice excerpt from Nelson & Helm, all other tracks featured this showÂ were originally engineered by Jim Cunningham at Local Sound Studio in Columbus Ohio (Fez) or atÂ Appalachian StudiosÂ in southern Ohio (Ample Parking). Many thanks to JimÂ and all the people who I was lucky enough to play music with during my time in Ohio. Special note: The photosÂ aboveÂ are of the original lineup of Fez which was a quartet…then with Mr. Mike Monett.